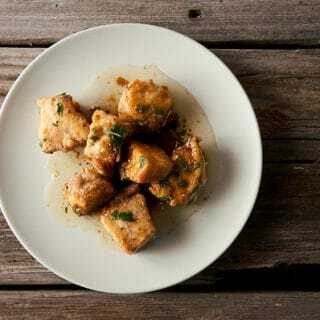 Sometimes simple is better, especially with a fish like rock cod. Pacific rock cod, or rockfish, are a catch-all name for a variety of bass-like fish that live in and around, you guessed it, rocks and wrecks along the Pacific coast from Alaska to Baja. They are to the Pacific what black seabass are to the North Atlantic and snapper to the South Atlantic and the Gulf. Or if you live inland, they’re a lot like large- and smallmouth bass. Rock cod are aggressive biters, as are every reef fish I’ve yet encountered. The hardest part about catching them is to a) keep your gear out of the rocks, where it’ll get snagged, and b) keeping the bouncing, head-shaking rockfish from popping off the hook. Most people can catch a limit if they fish long enough, but I happen to be especially good at catching them; chalk it up to nearly 40 years of doing this sort of bottom fishing. Driving home from one particular rock cod trip, I got an urge to make a fish sandwich. 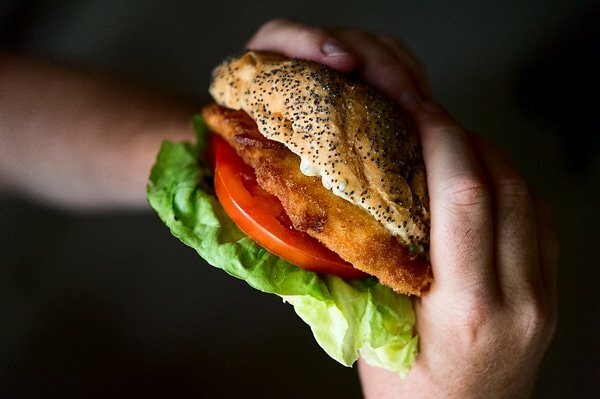 You know, a regular ole’ fish sammich, like a Boston Whaler or a Filet-O-Fish… only edible. What makes a good fish sandwich? It starts with the fish, which for me needs to be firm, white and lean. Not a fan of sandwiches made with fillets of salmon or mackerel or the like: Too soft, and too fatty. Rockfish are ideal. And it’s gotta be either grilled or fried. Breaded, as in this case, is easier, although a good beer battered, deep-fried fish is damn tasty, too. Buns? Anything from good rye bread to hamburger buns to hoagie rolls will do, but I am partial to poppy seed Kaiser rolls. It’s a Jersey thing, I think. Gotta have lettuce and tomato, for greenery, crunch, acidity and sweetness. And everything’s better with a slice of bacon. That leaves the sauce. I’ve had fish sandwiches with everything from ketchup to mustard to horseradish, remoulade, Asian dipping sauces, you name it. But the Big Daddy of sauces for a fish sandwich is tartar sauce. Only I hate store-bought tartar sauces, so I make my own. Too hard? Not so. A tartar sauce is basically mayo with a little mustard and some chopped pickles, plus a random onion product, hot sauce and salt. Easy-peasy. 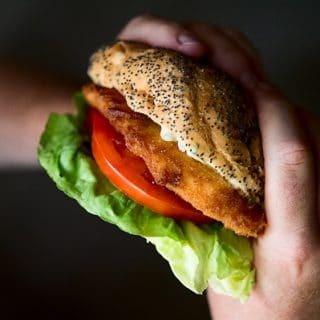 This is how I like my fish sandwiches, but as you know there are endless variations in terms of buns, fish species and how they are prepared, not to mention condiments and accompaniments. I use Pacific rock cod (rockfish) for this, but any lean, white, bass-like fish will do fine. Some alternatives would be black seabass, largemouth or smallmouth bass, lingcod, croaker, walleye, catfish, red drum... you get the point. 4 skinless fillets of rock cod or other bass, seabass , walleye, etc. If you're making homemade tartar sauce, do this first by mixing everything in a bowl. Cover the bowl with plastic wrap and set in the fridge. Fry the bacon slowly in a pan until almost crispy; you want a little bend in your bacon for a sandwich. Set the bacon aside and discard the fat in the pan, or reserve it for another recipe. Get all your fixins' ready for the sandwiches, and get three shallow containers out for the dredging station: One for the flour, one for the beaten eggs, and one for the breadcrumbs. Take the fish out of the fridge and salt them. Pour the oil in the pan you fried the bacon in and heat it over medium-high heat until it's about 350°F -- if you don't have a thermometer, flick a little flour into the oil. When it sizzles immediately, you're ready. Turn the heat down to medium for a moment. Dredge the fish fillets in flour, then dip in the egg, then in the breadcrumbs. If you want a really thick and crispy crust, dip the fillets in egg and breadcrumbs a second time. Turn the heat to high on the oil and gently lay the fillets into the pan. Make sure they are not touching each other. Let them fry for a minute or so, then adjust the heat down; adding the fish drops the heat of the oil, which is why you want to kick the heat up for a minute or two to compensate. If you can't get all the fish into the pan at once, fry in batches. Fry the fish until they are golden brown, about 2 to 5 minutes per side; use the longer range if your fish fillets are thicker than an inch. Set on paper towels to drain. 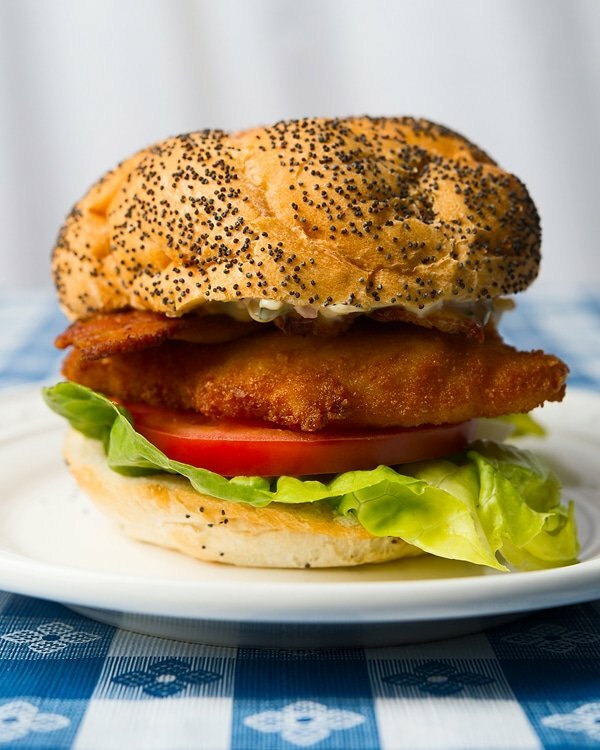 Spread the tartar sauce on both sides of the buns, then add the lettuce, fish fillets, tomato and bacon. Open a beer and enjoy! If you're like me and don't much care for store-bought tartar sauces, making your own might change your mind. My recipe is essentially borrowed from my friend Elise's over at Simply Recipes, only I used chopped kelp pickles. Any good pickle will do, however. You can find all sorts of recipes for all sorts of fish and seafood here on Hunter Angler Gardener Cook! You treat you ocean salmon any different than great lakes salmon or trout, when it comes to handling/cooking them? Wisconsin native here that pulls in a few salmon, rainbow and lake trout from Lake Michigan with the help of some friends. Eric: I tend to smoke most lake salmon.